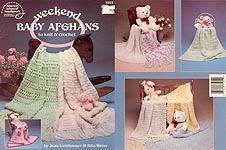 Weekend Baby Afghans to Knit and Crochet, designed by Jean Leinhauser & Rita Weiss, American School of Needlework, 1987. 9 designs. May have mar on front cover where price tag was removed and/or some cover wear, but overall good condition. 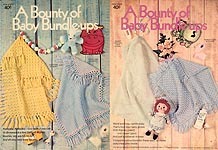 A Bounty of Baby Bundle- ups, designed by Estelle Resnick and Donna Bellamy, Boye Needle Company, nd (but my guess would be late 70's - early 80's). Patticake Blanket and Jack & Jill Plaid (both made with double ended hook), Brookstick Lace Daffodil baby Blanket, KNIT Sweet Dreams Crib Shawl, Warmy Toes/ Diddle Dumpling Booties. Page yellowing, overall wear. Just For Me, designed by Tammy Kreimeyer, Leisure Arts, 1996. 12 baby afghans. Corners are a bit bent, but otherwise, very good condition. 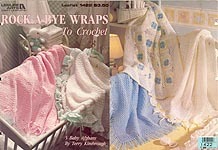 Rock- A- Bye Wraps to Crochet, designed by Terry Kimbrough, Leisure Arts, 1992. 5 pretty designs. Tag residue on cover; overall very good condition. 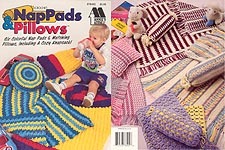 Knit and Crochet Baby Afghans, Annie's Attic, 1987. 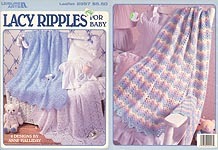 Digest- size book with 5 designs: KNIT Hooded Baby Shawl; CROCHET: Hooded Baby Blanket, Round Popcorn Afghan and Pillow, Waffle Weave Baby Afghan, and Aqua Diamond Baby Afghan. Excellent condition. Baby Mile- A Minute Afghans, designed by Jennine Korejko, Leisure Arts, 1993. 6 designs in sport weight yarn. Corners bent but otherwise excellent condition. 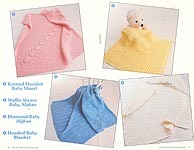 Quick & Sweet Baby Afghans, designed by Anne Halliday, Leisure Arts, 1999. 7 designs in worsted weight yarn. New, but mar on front cover from price tag removal. Baby Afghans to Knit and Crochet, Leisure Arts, 1976. Wonderful "vintage" leaflet with four designs: KNIT -- Ripple; CROCHET -- Ripple, Buttercup Squares, Granny Square. May be age- yellowed, but otherwise good condition. 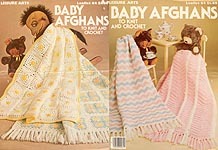 Baby Afghans to Knit and Crochet 2, designed by John Feddersen, Jr., Leisure Arts, 1977. Wonderful "vintage" leaflet with six designs: KNIT -- Ripple, Fan & Feather, Seed Stitc Border; CROCHET -- Ripple, Granny Square, Shell Stitch. May show some age- yellowing of pages, but otherwise good condition. Baby Afghans to Knit & Crochet 3, Leisure Arts, 1980. An oldie but a goodie -- KNIT Tied Quilt- Saures, Basketweave, and Diagonal Ridges; CROCHET: Afghan Stitch Rose Garden, Frosted Stripes, Lemon- Lime Stripes, and Afghan Stitch Teddy Bear (bear is worked right into the crocheting, changing colors as you go along). Some cover & page wear, but no stains, odors, or writing -- good condition. 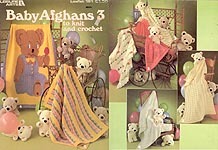 Baby Afghans to Knit & Crochet 3, Leisure Arts, 1980. An oldie but a goodie -- KNIT Tied Quilt- Saures, Basketweave, and Diagonal Ridges; CROCHET: Afghan Stitch Rose Garden, Frosted Stripes, Lemon- Lime Stripes, and Afghan Stitch Teddy Bear (bear is worked right into the crocheting, changing colors as you go along). SERIOUS CONDITION PROBLEMS: worn, stained, pages detached from center staple, you name it. Plus, smells of fabric softener sheet. Quite honestly, if that Teddy Bear afghan weren't so cute, I'd just pitch this -- but all instructions and graphs are intact and useable. 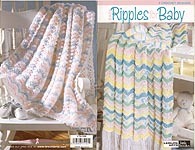 Lacy Ripples for Baby, designed by Anne Halliday, Leisure Arts, 1997. 6 designs in sports weight yarn. Excellent condition. Rock Me Gently Baby Afghans, designed by Shobha Govindan, Leisure Arts, 1994. 6 designs with a diamond theme, three to KNIT and three to CROCHET. Excellent condition. 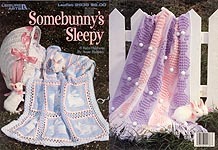 Somebunny's Sleepy, designed by Anne Halliday, Leisure Arts, 1997. 6 bunny- themed designs in sports weight yarn. Cover & page wear, some page yellowing, some pencil checkmarks by rows. Overall good used condition. 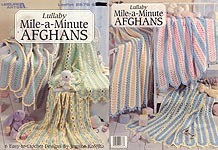 Lullaby Mile- a- Minute Afghans, designed by Jennine Korejko, Leisure Arts, 1995. 6 easy designs in sports weight yarn. New. Animal Afghans to KNIT, designed by Barbara Boulton, Leisure Arts, 1989. 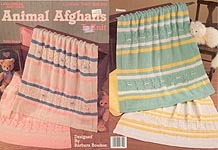 Basic afghan with Bear or Kitten panels. Some cover wear, but otherwise very good condition. Easy Ripples for Baby, Leisure Arts Little Books, 2005. Digest-size booklet containing 4 crochet designs in worsted weight yarn: Lullabye, Candy Stripe, Sleepy Time Ripple, and Baby Love. Materials heading on all patterns highlighted in orange, needle holes in one page. 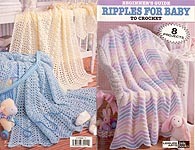 Beginner's Guide: Ripples for Baby To Crochet, Leisure Arts Little Books, 1999. 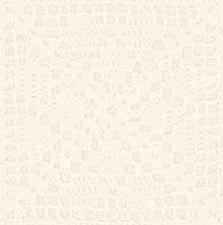 Digest-size booklet containing 8 different ripple designs using various stitch combinations. Excellent condition. 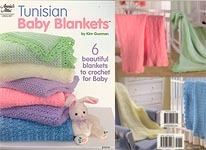 Tunisian Baby Blankets, designed by Kim Guzman, Annie's Attic, 2006. 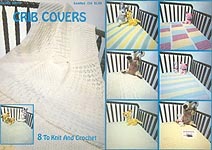 6 beautiful blankets to crochet for baby in "fine" baby or sport weight yarn. New. Crochet Nap Pads & Pillows, designed by Ann Parnell, Margaret Kremer, and Deborah Levy-Hamburg, Annie's Attic, 1995. Six colorful sets, including a cozy knapsack. New. 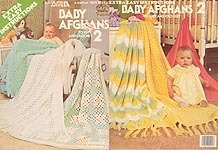 Beautiful Baby Afghans, designed by Mary Middleton, Annie's Attic, 2002. 6 soft wraps made using the Crochenit cable hook and baby or worsted weight yarn. New. May smell slightly of cigarette smoke. 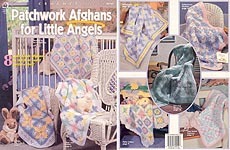 Annie's Attic Mile-A-Minute Baby Afghans, designed by Annie Potter, Annie's Attic, 1990, 1991, 1992, 1994, 1997, 2006. Six quick and fun-to-make designs in knitting worsted: Basic Mile- A- Minute, Baby Rings, Bright Ribbons, Cowboy Denim Blues, Lollipops, Eyelet Ribbon. Very good condition. Please note: every reprint seems to have had a different cover, so editions available may have covers that differ from the one shown. 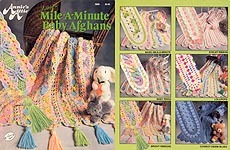 Annie's Attic Mile-A-Minute Baby Afghans, designed by Annie Potter, Annie's Attic, 1990, 1991, 1994. Six quick and fun-to-make designs in knitting worsted: Basic Mile- A- Minute, Baby Rings, Bright Ribbons, Cowboy Denim Blues, Lollipops, Eyelet Ribbon. SERIOUS CONDITION PROBLEMS: Former owner apparently made these afghans again and again -- this one is past "well loved" and into "used and abused." Pages are detached from center staple, torn almost all the way up at the seam, rips on the pages that have been taped, writing, wrinkled, you name it. Normally, I'd toss this into the recycling -- but if all you want are all the words on the pages -- here they are! Annie's Attic Quick as a Wink Baby Afghans, designed by Martha Brooks Stein, Annie's Attic, 2000. Five blanket designs that work up quickly in worsted weight yarn. New. 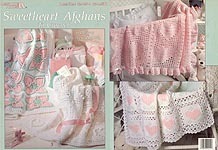 Sweetheart Afghans to Crochet, designed by Anne Halliday, Leisure Arts, 1993. Six designs with a heart theme, worked in sports weight yarn. Definitely used -- cover & page wear; former owner made diagrams and lots of notes on Hearts & Ruffles pattern. Notes are distracting, but everything is readable. 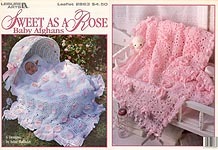 Sweet As a Rose Baby Afghans, designed by Anne Halliday, Leisure Arts, 1996. Six designs with a rose theme, worked in sports weight yarn. New. 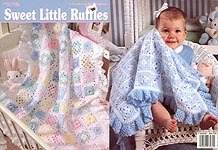 Sweet Little Ruffles, designed by Anne Halliday, Leisure Arts, 1998. Six designs of granny square variations with deep ruffled borders, worked in sports weight yarn. Corners bent from mailing, but otherwise very good condition. Crib Covers, Leisure Arts, 1978. Eight designs. Knit: Aran Isle, Rainbow, Sampler. Crochet: Diagonal Stripe, Puff, Rainbow, Diamond Motif, & Lace Panels. I never used this booklet, but it's suffering from years of improper storage -- cover worn. 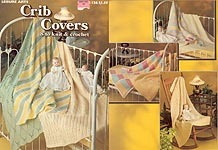 Crib Covers, Leisure Arts, 1978. IDENTICAL TO ABOVE, BUT WITH DIFFERENT COVER. Very good condition. 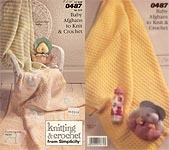 Knitting & Crochet from Simplicity #0487: Baby Afghans to Knit & Crochet: Simplicity Pattern Co., Inc., 1989. Six different patterns; some writing on cover but otherwise in good shape. 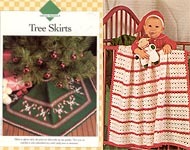 Tree Skirts / Baby's First Christmas Afghan, Vanna's Afghan and Crochet Favorites, 1995. Afghan works up quickly in easy stitches and worsted weight yarn. Also afghan stitch tree skirt with charts to embroider candy canes or ornaments included. Very good condition, but may have faint smoky smell. Page, background, and graphics Copyright © 2005 - 2008,Hook and Web Designs. All Rights Reserved.